Humphrey Deforest Bogart was born on January 23, 1899, in New York City to Deforest Bogart, a surgeon, and Maud Humphrey Bogart, an illustrator. He attended several private schools, including Trinity School in New York and Phillips Academy in Andover, Massachusetts. He performed poorly and was expelled at one point. Somewhat surprisingly Humphrey was not particularly interested in drama as a schoolboy. Bogart left school to serve in the U.S. Navy during World War I (1914–18; a war that involved many European countries as well as Russia, the United States, and areas in the Middle East). While on assignment in the military police, a prisoner tried to escape and struck Bogart in the mouth. Bogart was left with a scar and a slight lisp. These gave a more sinister quality to his already gravelly voice. When he returned home he worked briefly as a Wall Street (the area of New York City where the stock exchange is located) clerk. Bogart was never interested in dramatics when he was growing up. However, one of his parents' neighbors was a producer for the theater and offered Bogart a job in his office. Eventually, Humphrey became a stage manager (the person who assists the director and runs the stage for a play or musical) and then began acting himself. Acting did not always come easy for him. Although he did get roles, at one time he became so nervous that he ran offstage in the middle of a performance. After a considerable struggle Bogart achieved recognition with his two most important stage appearances: in Maxwell Anderson's (1888–1959) comedy Saturday's Children (1928) and Robert E. Sherwood's (1896–1955) gangster morality play, The Petrified Forest (1936). In The Petrified Forest he played a mentally ill killer, Duke Mantee. This performance, as well as his performance in the popular film version with Bette Davis (1908–1989) and Leslie Howard (1893–1943), led to typecasting (repeatedly being asked to perform similar roles) him as a tough guy. He played mobsters in the movies Dead End (1937), Angels with Dirty Faces (1938), and The Roaring Twenties (1940). Not until Bogart's performance as the cold, uncommitted private detective Sam Spade in John Huston's (1906–1987) adaptation of Dashiell Hammett's novel, The Maltese Falcon (1941), did Bogart reveal his potential as a screen personality. His co-starring role with Ingrid Bergman (1915–1982) as Rick Blaine in Michael Curtiz's (1888–1962) war drama Casablanca (1942) added to his legend and led to his first Academy Award nomination. He lost, but the film won Best Picture honors. Bogart next performed in To Have and Have Not (1944), a screen version of Ernest Hemingway's (1899–1961) novel of the Great Depression (1929–39; a period during which poverty was widespread due to terrible economic conditions) transformed into a comedy of social consciousness. Bogart was cast opposite Lauren Bacall (1924–). The following year Bogart divorced his third wife and married Bacall. They had two children together. Humphrey Bogart takes the tough-guy role to its psychological limits…"
In a very different film, the adventure-comedy The African Queen (1951), Bogart won an Academy Award for his humorously expressive depiction of the earthy, gin-guzzling boat captain who brings life to a straight-laced Katharine Hepburn (1907–). In The Barefoot Contessa (1953) Bogart gave depth to his role as a shattered, alcoholic film director. In Beat the Devil (1954), he portrayed a disreputable adventurer. 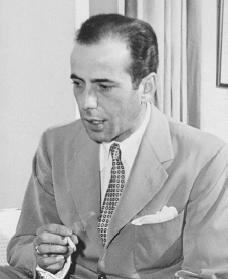 The Caine Mutiny (1954) provided Bogart with one of his finest roles, as the unstable Captain Queeg. In his last film, the sharp-edged boxing drama The Harder They Fall (1956), Bogart gave a strong performance as an investigator of sports corruption. A year later, on January 14, 1957, after a long struggle with throat cancer, he died in Hollywood. Bogart was not only admired for his great talent, but also for his professionalism. He always arrived on the set knowing his lines and knowing exactly what he was supposed to do. He always cooperated willingly with the directors of his films. At his funeral, director John Huston, Bogart's longtime friend, paid him tribute: "He is quite unreplaceable. There will never be anybody like him." Myers, Jeffrey C. Bogart: A Life in Hollywood. Boston: Houghton Mifflin, 1997. Sperber, A. M., and Eric Lax. New York: William Morrow and Co., 1997.